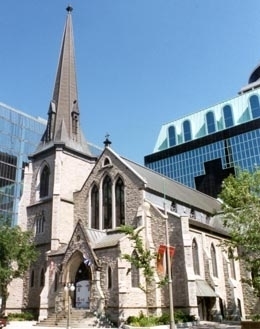 St. Andrew’s is a historic church in downtown Ottawa that has halls and rooms of various sizes available for community use. The main church or Sanctuary is an excellent space for concerts and recitals. A number of other venues are ideal for other activities such as small piano recitals, medium-size classes of various sorts, meetings, presentations and receptions. The rooms and facilities are immaculately maintained in a beautiful architectural context. All venues and facilities are fully accessible. St. Andrew’s is located at the corner of Wellington and Kent (82 Kent St.) directly across from the Supreme Court of Canada. It is within walking distance of offices and attractions in the downtown core. It is close to public transit and the LRT station and public parking which is free on weekends and after 6:00 PM. Rental rates for the meeting spaces are reasonable and competitive. St. Andrew’s main church or Sanctuary is beautiful and is always perfectly maintained. It is ideal for medium-sized musical events. Its acoustics are judged to be outstanding. It has an excellent configuration for concerts and recitals with a central location for small musical ensembles and/or choirs generating a feeling of intimacy between the performers and the audience. Its capacity is about 450 up to a maximum of 600 plus a balcony for about 50. The area for musicians is about 22’ by 13’ (with optional elevated platform) and additional space for risers for a choir. Renting the Sanctuary can come with an additional space, (Grant Hall and St. Andrew’s Hall, the Currie or Pottinger rooms. to serve as a preparation, storage or quiet room for performers, musicians and soloists. Width 21 ft., Length 45ft., 945 square feet. Capacity: 130 standing, 80 with chairs only and 50 seated with tables. Grant Hall is a spacious room appropriate for meetings and receptions and for multi-purpose activities with youth or other groups. It can be configured and furnished so as to accommodate a broad range of purposes and events. It also can be utilized in conjunction with concerts in the Sanctuary. There is an attached kitchenette, with a serving window, for coffee and tea preparation and for the serving of light snacks. An automatic dishwasher is available. Width 19 ft., Length 38 ft., 722 square feet. 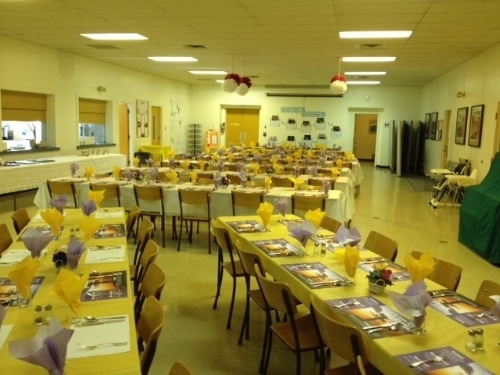 Capacity: 85 standing, 65 with chairs only, and 30 seated with tables. The Currie Room is an ideal room for smaller meetings. A large central table is useful for conducting a business meeting. It also can be moved to the side and the room can be arranged for alternate uses. Additional tables can be set up for any configuration required. 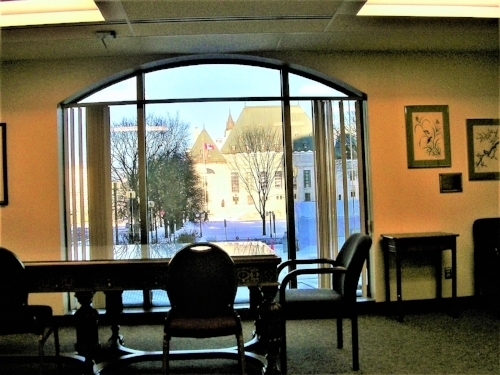 The room has an intimate atmosphere, with wide windows looking onto a courtyard and a spectacular view of the Supreme Court of Canada. There is a grand piano at one end of the room around which upholstered chairs can be grouped. An adjoining kitchenette is available for coffee and tea preparation. The Pottinger Room is a more intimate room, suitable for small gatherings. It has space for a couple of meeting-sized tables with chairs. Two sofas are in front of wide windows which maintain privacy through one-way glass. Capacity: 300 standing, 200 with chairs only, and 120 seated with tables. Spacious and airy, with a tile floor. St. Andrew’s Hall is suitable for various types of meetings, banquets, receptions or other events. It is a flexible space that can set up with chairs for a lecture or town hall discussion or can be used for physical activity. The room has access to a large kitchen for coffee and tea and washing-up facilities. It is fully accessible, with an elevator at 84 Kent St. giving access to the main church and a second elevator down to the Hall. There are four rooms off St. Andrew’s Hall, the largest at 12 ft. by 24 ft., suitable for small meetings, or “break-out” sessions from major meetings in the Hall. Rooms and Halls can be configured by to suit your needs. Microphones, flip carts and more are available at no additional cost. “Risers” are available in the Sanctuary for choirs. There are a number of public parking spaces and garages near St. Andrew’s for use during working hours on weekdays. On weekends and after 6:00 PM on weekdays, free and convenient public parking is available just across Wellington Street in the areas around the Supreme Court and between the Supreme Court and the National Archives.